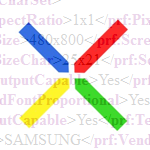 After some digging around (thanks, Florin and others who raised valid concerns), a similar file for the Nexus S was discovered on Samsung's site in the very same folder (nexuss.xml). The two turn out to be exactly the same, save for the model numbers of the devices they represent. It would appear that the Nexus Prime file is nothing more than a placeholder with all data copied straight from the Nexus S file, so the specs listed within are in no way official. The Android community can now exhale a collective sigh of relief, sit back, and wait for the official details of the Nexus Prime to surface.